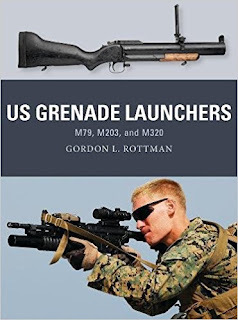 This book is a thorough study of the 40mm grenade launcher systems carried by soldiers of the U.S. military. Little did I know when I arrived at my line battery and was handed an M203 that a lot of thought and development had gone into the weapon. The grenade launcher was designed to cover the indirect fire "dead zone" between the reach of mortars and the throw of hand grenades. U.S. soldiers had previously used rifle grenades to cover this area but through the use of grenade launchers (dedicated M79s at first and then later under-the-barrel launchers like M203) the soldier could not only hit a target but could use pyrotechnics and specialized munitions. Despite the slightly heavier weight of the M203 over the M16A1 I came to appreciate the weapon. I only got to fire the grenade launcher ONCE (our unit had M203s but were not issued ammunition for qualification) and that under the worst possible conditions. Nevertheless, I dropped a round into the top hatch of a target-practice tank, lighting it up for a moment like a Christmas tree. The M203 is a very respectable weapon. The book is well-written and illustrated with photos and original artwork. An excellent guide to our grenadiers.